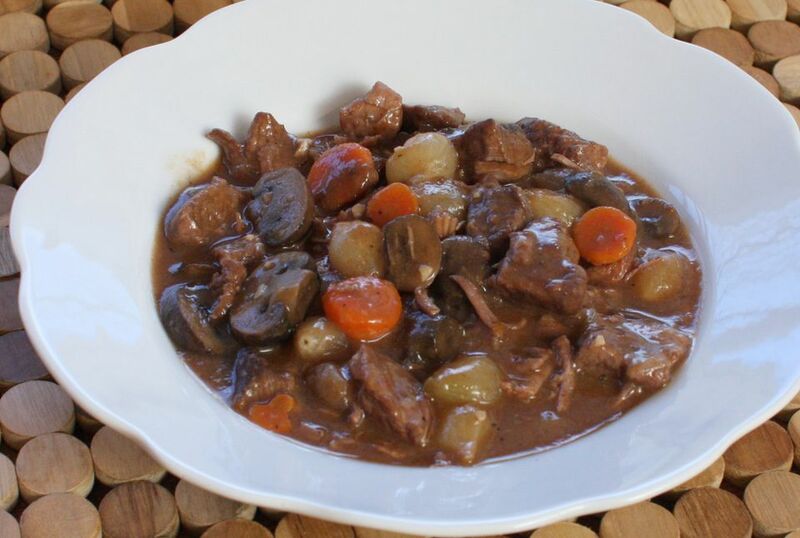 This classic slow cooker beef stew is hearty and flavorful, everything you would want from a beef stew. This makes a fabulous snow day or busy winter day meal along with a Caesar salad and crusty French bread. Feel free to use a little apple juice, beer, or more beef broth in place of the red wine, or baby ​portobello in place of the button mushrooms. In a large skillet or sauté pan over medium heat, cook the diced bacon until almost crisp and fat has been rendered. With a slotted spoon, transfer the bacon to paper towels and leave 1 tablespoon of drippings in the skillet. Refrigerate the bacon; it will be added to the stew near the end of the cooking time. In a food storage bag, combine the flour, salt, and pepper. Add the beef pieces and toss to coat with the flour mixture. Cook the beef in the bacon drippings over medium heat, stirring constantly, until the beef is nicely browned on all sides. Transfer the beef to the crockery insert of a slow cooker. Top with the mushrooms, thinly sliced carrots, and thawed onions. Combine the wine, beef broth, tomato paste, and garlic. Pour over the beef and vegetables. Cover and cook on LOW for 8 to 9 hours or on HIGH for 4 to 5 hours. Stir in the thyme, rosemary, and the reserved bacon. Continue cooking on HIGH, uncovered, for 15 minutes longer. We made this stew in a 7-quart slow cooker, but a smaller slow cooker would work as well.